Hope all of my lovely readers have a wonderful Labor Day today. If you are travelling please drive carefully. See you tomorrow with some yummy recipes. Happy Labor Day! Ooh, something caught my eye in your shop so I'm off to Etsy. Same to you! No traveling for us. Hangin' out at home - my kind of day! LOL! 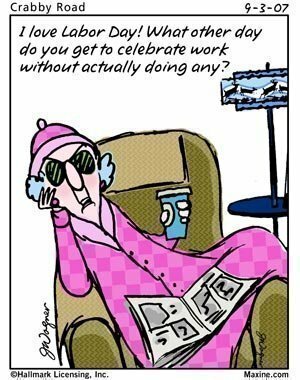 I love Maxine. Sadly, I spent half of my day off staining the deck :-(. Still better than my day job! But the weather was beautiful. *cute* I needed a laugh today!